A 73-year-old Texas lawyer is suing United Airlines after an employee shoved him to the ground and left him there. On Tuesday, Houston news station KPRC aired surveillance footage of the 2015 incident at Houston's Bush Intercontinental Airport. The video shows passenger Ronald Tigner, then 71, talking with a United employee. According to the lawsuit filed last week, Tigner had asked him for help with getting a new boarding pass, and the employee laughed and cursed at him. Tigner reportedly told the employee to stop smiling, and that's when the employee shoved him. The push is visible in the video. 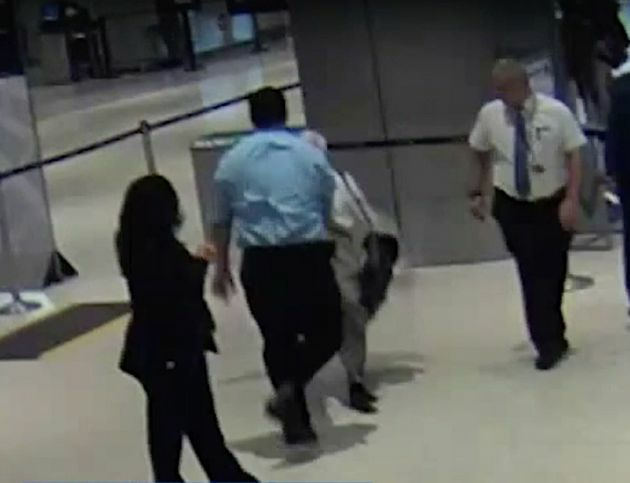 Surveillance video shows passenger Ronald Tigner being shoved to the floor by a United Airlines employee in a blue shirt. The video shows Tigner lying on the ground as employees appear to offer no assistance. Not until a fellow passenger rushes over and kneels down beside him does someone call for help. KPRC also obtained a 911 call from the incident in which a United employee says Tigner "has fallen down" and says he does not know why he fell. The employee who shoved Tigner was later charged with injury to an elderly individual, KBRC reports. He was fined and ordered to apologize and attend anger-management classes. Tigner tried to rectify things with the airline but wasn't pleased with United's slow response, his lawyer William Hoke told HuffPost. Tigner decided to file a lawsuit after seeing footage of Dr. David Dao being dragged off a United flight in April. "[Tigner's] main concern was getting his story out there so the traveling public knows about this, and instead of talking about core values [United] will actually do something to stop it," Hoke said. "The most astonishing part is that nobody helped him." United apologized in a statement issued this week. United, along with otherairlines, has taken heat lately for a string of unsavory exchanges between passengers and employees. Besides Dao, a disabled Florida woman sued United, claiming she was injured by employees during a flight from Houston in September. In May, a North Carolina father announced plans to sue United after he was accused of molesting his son on a flight.